You only need to take a look at the station’s wide extension of tracks to confirm that Monforte has been and continues to be one of the most important railway junctions in Galicia. The train was forever linked to this noble and medieval town in the late nineteenth century . 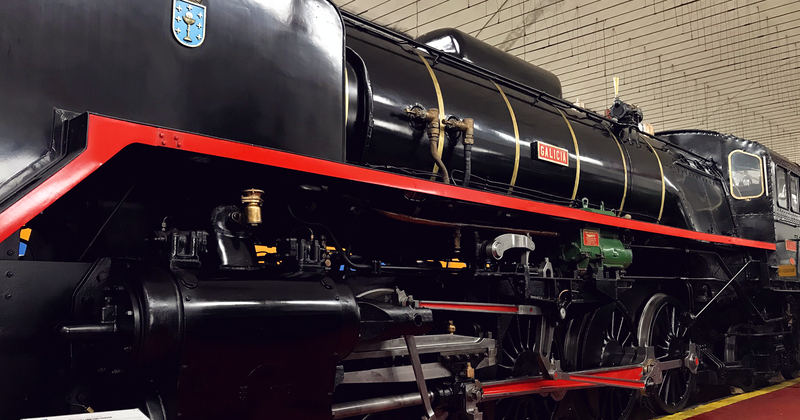 Nowadays, the capital of the Terra de Lemos proudly preserves its past in the Museum of Galician Railways (MUFERGA), an essential visit to learn about the history of the town and a place that will appeal to young travellers. After several decades of work to overcome the mountains of the galician East, in the summer of 1883 the railway lines existing in Galicia were permanently linked to those of the central plateau. The arrival of the route to Monforte and its inauguration, under King Alfonso XII, meant the communication of the ports of A Coruña and Vigo with the rest of the Peninsula. It was in Monforte where the main line, originating in Madrid, was served, and the enormous progress that the train brought to the town earned it the title of city. Around the station an important industrial nucleus and railway repair workshops were created, until, in the mid-twentieth century, the change of technologies brought along a decline. Monforte, specialized in steam engines, lost much of its privileges as a communications hub, although it is still one of the most important stations in Galicia. It is in one of those buildings where steam engines were repaired that the MUFERGA stands today. In its interior, railway material from the twentieth century is conserved. One of the most popular locomotives is the Mikado, built in the United Kingdom in 1953 and used until 1975 in various lines throughout Spain. It ran on steam, and the generalization of diesel oil relegated it to a tourist train. Nearby you can see one of the first diesel locomotives to enter into service, a Canadian Alco 1812, or a British 7700 from the fifties. You can also contemplate the luxury of train cars such as the lounge car ZZ1, built in wood in the Basque Country in the 20s of last century with all the technological advances of the time. A walk around the warehouse also shows us what railway command centres were like seventy years ago through original machinery and models. Inside the enclosure but at approximately one kilometre away is the real jewel of the MUFERGA: the forty-track roundabout where, thanks to a rotating bridge, trains could change direction or enter hangars for repairs. It is a building of enormous historical importance, because in all Europe very few with these characteristics are conserved. It can only be visited with guided tours, which must be scheduled in advance with the Museum, and its appearance, just like something out of a cartoon, makes it unforgettable for kids. Children will also enjoy the miniature train that runs through all the MUFERGA facilities. The small railroad crosses tunnels, sets of points, and even a station to scale making the kids protagonists in a story that is purely Monforte.